Question: What is the role of the Grader? The Part 6 Grader is a mentor and a coach for Candidates. None of us would be where we are today unless someone had taken the time and effort to mentor us and also to administer and grade our exams. Thorough assessment and thoughtful critiques are of paramount importance to providing meaningful test results to Candidates. Question: Why should I volunteer? A CRM credential is set apart because of the requirement be evaluated on writing a business case in the form of the case study essays but the case studies can’t be graded by software as are parts 1 – 5. The Part 6 exam must be read and evaluated by an experienced RIM professional who is a CRM. We still rely on the CRM’s who volunteer and spend their time to provide quality evaluations and write good critiques to accomplish the grading of Part 6. One of the benefits of grading is the receipt of 3 certification maintenance points per exam to compensate for the time spent on grading. Most graders appreciate that they too continue learn by carefully examining the ICRM’s proprietary case studies assigned to the candidate during each grading cycle. Question: Am I eligible to be a Grader? The criteria for graders is fairly straightforward, be a CRM in good standing, watch the training presentation, sign an Non-Disclosure Agreement (NDA), then commit at least 3 hours per exam for the grading process. Question: How do I volunteer to be a Grader? If you would like to Grade Part 6 Exams and have not previously done so then please follow these instructions to become listed as an available Grader for future exams. Log onto the ICRM database portion of the web site. In View Personal Details select the Tab called Grading. 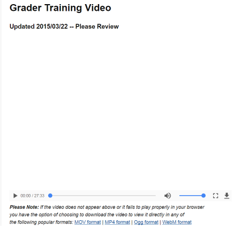 Watch the Grader Training Video. At the conclusion of the training, click the button marked Volunteer as Grader. Choose the nearest Exam cycle and , Number of Answers you are willing to grade. The “Types of Answers” you are willing to grade refers to the different exam questions for a particular exam period. There are 3 questions per exam, but you are not able to over-ride the default of one question type per cycle. You will also be required to accept the NDA. Read it, then click the box to accept. Accept the NDA and click Continue. As soon as the next Grading Cycle begins the Regent responsible for Grading will send out a grading request. You may be required to re-accept the NDA in order to be assigned exams. If you can no longer grade a particular exam there is an option to indicate you are no longer available for that exam. Please let us know as early as possible so we ensure there are enough available graders. However, if you have already been assigned exams to grade, please honor your commitment to grade the exams. If you do not grade within the timeframe provided for each exam, you may be dropped from the list of graders. If you have graded for the ICRM within the last three test cycles, then you are already listed as an available Grader for future exams. You will be reminded at the beginning of each new grading cycle that you may choose to serve as a grader again. Question: How do I retrieve grading material from the ICRM Database? From the menu on the left, click on View Personal Details. At the top of the screen, select Grading. From the list that is displayed, select the appropriate Exam. Select an exam answer for grading by clicking on the Identifier number on the left side of the table. Write down the identifier number. NOTE: The identifier number represents an exam part in the system. After grading, make sure you upload the correct answers for the correct exam part, using the identifier number. Select View/Print Original Exam Questions. When asked to Open or Save the file, select Open. The document will open in a new screen. Print this document and then close the window. Once you close this window, it will return you to the website. Print the grading material. Once printed, close the window to return to the web site. Once you have confirmed that you have retrieved all the files successfully, select Acknowledge Exam to Grade as Downloaded. This will let the Regent know that you have the exam. NOTE: Type your critique offline the in Plain Text, using the outline in the Grading Guide document, and then copy and paste the completed critiques into the database. This will prevent loss of your work due to timeout settings in the database. Question: What are the guidelines for providing Candidate feedback? Candidates rely on feedback to determine what areas to improve to successfully pass Part 6. It is the Grader’s responsibility to let the Candidate know the strengths and weaknesses of his or her exam responses. The grader serves as a silent mentor, guiding Candidates to a passing grade in the next cycle. Please keep the following general guidelines in mind when preparing the required critique of each exam response. Provide feedback containing both positive comments and constructive criticism. Write comments that clearly justify and explain the grade. Provide a breakdown of the points earned as outlined in the Grading Guide. For example, if four points are the maximum number allotted for a statement of the problem, state the assessed score and provide a supporting explanation. NOTE: Use the Grading Guide and Critique Prompt document provided in the grading package you downloaded to assist with the formatting of your critique. You will craft your critique offline and copy and paste it in the appropriate field in the database. This will ensure that you are not “timed out” by the database and lose your work. Write comments that will serve to prepare the Candidate for the next exam cycle. Be as specific as possible in problem areas without giving away test question information. Identify areas that should have been addressed, e.g., operation of the company as a whole, critical areas of RIM, technological issues). Check the spelling and grammar in your comments. Question: What categories should be considered in my comments? Instructions. Did the Candidate follow the exam instructions and provide the information as requested? Tell the Candidate if the statement of problem and summary of findings were strong or weak. Tell the Candidate if he or she followed directions or went off on a tangent that was not supported by the arguments in the answer. Format. Did the Candidate follow the format requested? Provide feedback on how to write a formal business report, e.g., what types of information does senior management like to see. Narrative. This section focuses on the Candidate’s ability to write and communicate ideas. Provide feedback on grammar, spelling, logical arrangement of ideas, and fluidity of the discussion. RIM Knowledge. Did the Candidate address the RIM issues requested in the case? Did he or she understand the relationship of RIM issues and how they are interconnected to make the business or operation successful? Did the Candidate provide adequate and logical arguments for his or her choices? Provide guidance on what the Candidate needs to review for future exams. Other Comments. Be a mentor by providing advice and encouragement. Share knowledge and experience and give the Candidate ideas on how to improve the overall response during the next cycle. Question: How do I add exam grades and critiques to the ICRM Database? At the top of this screen, select “Grading.” Then select the title of the current exam. Select an exam to be graded by clicking on the identifier number of the left side of the table. In the Score field, enter the numerical grade, e.g., for a score of 42 out of 50, enter 42. In the Critique field, paste the .txt file you typed offline. Repeat Steps 3 thru 7 to add remaining grades and critiques.